MyHome Design + Remodeling shares a new report from National Kitchen and Bath Association showing how kitchen design is being influenced by current technology usage of homeowners. At MyHome’s showroom in Manhattan, homeowners can test out kitchen technology such as lighting controls, music/speaker connections, smart TVs and charging stations. Most designers and consumers only know enough about technology to ask the basic questions. This emphasizes the importance of choosing a knowledgeable designer and contractor when remodeling. Recent National Kitchen and Bath Association (NKBA) report shows homeowners are using technology in their kitchen, not only for email/texts or surfing the web, but also for looking up recipes, online grocery shopping and prep. The shift in technology usage is impacting kitchen design. The report surveyed homeowners ages 25-65 planning a kitchen remodel within the next 24 months. These homeowners are looking to kitchen showrooms, appliance manufacturers, technology providers, contractors and designers for kitchen technology ideas. The top three areas where consumers seek knowledge from their designers are in smart appliances, Wi-Fi connectivity and centralized lighting controls. So, which kitchen technology options do homeowners find most appealing? Of the homeowners surveyed, 83% want smart appliances, 65% would like places to stand or display mobile devices and 67% desired integrated charging for mobile devices. Wi-Fi connectivity and cooking appliances to prevent overcooking also highly appeal to consumers. Other appealing features include kitchen technology that allows the consumer to control the home’s temperature or security system and create preset lighting scenes. Consumers also find appliances with smartphone connectivity and touch-screen features appealing. Already, one third of designers are frequently recommending integrated kitchen technology solutions to their clients. According to the report, most designers and consumers only know enough about technology to ask the basic questions. This emphasizes the importance of choosing a knowledgeable designer and contractor when remodeling. As a leader in kitchen and bath remodeling, MyHome wants its customers to understand the options currently available. 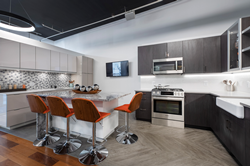 At MyHome’s recently renovated Kitchen and Bath showroom in Manhattan, homeowners can test out kitchen technology such as lighting controls, music/speaker connections, smart TVs and charging stations. Key findings of the report also included the top perceived benefits of adding kitchen technology. The NKBA reports ‘Adds to Home Value’ as a top benefit of adding kitchen technology. Further benefits of adding kitchen technology include: saves time, is fun, improves appearance, and creates a comfortable space. The National Kitchen & Bath Association (NKBA) is the not-for-profit trade association. With nearly 14,000 member companies representing tens of thousands of members in all segments of the kitchen and bath industry, the NKBA has educated and led the industry since the association’s founding in 1963. For more information, visit http://www.NKBA.org or call 1-800-THE-NKBA (843-6522). Download a free kitchen planning guide at http://www.myhomeus.com.